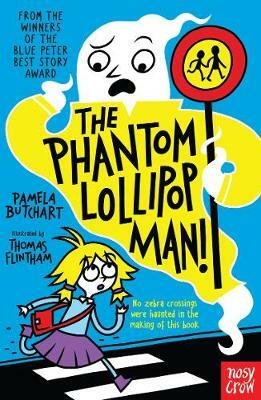 Laugh-out-loud fun from Blue Peter Award winners Pamela Butchart and Thomas Flintham.Read more of Izzy's adventures!Baby Aliens Got My TeacherThe Spy Who Loved School DinnersMy Headteacher Is a Vampire RatAttack of the Demon Dinner LadiesTo Wee Or Not To Wee!There's a Werewolf In My Tent! It was funny when Maisie cut holes in Izzy’s tights and Jodi said that Izzy should go and check if she had any ghost burns on her bottom but Izzysaid her bottom felt fine. I liked Maisie because she seemed to know the lollipop man well and he liked her too. I would like to recommend you this book because it is quite funny. I think that that this book is a very enjoyable book and I like the parts when they try coming up with theory's on how the lollipop man is actually dead/a ghost when he is not. My favourite character would be Izzy (the main character) because she isn't scared and try's to come up with plans. It was an interesting and adventurous book. Once I started reading it I couldn't stop. It was really exciting. My favourite character is Maisie because she always gets super scared and faints. It was really funny. This book was great entertainment and it had a lot of enthusiasm. The best bit was the happy ending at the end.